The HTC One (M8) is an Android smartphone with with a 4-megapixel camera and a 28mm equivalent lens with a fast maximum aperture of f/2 and new "smart stabilization" system. HTC's newly refined "UltraPixel" camera features a backside-illuminated sensor with a pixel size of 2.0 µm and sensor size of 1/3-inch, both much bigger than rival smartphones. The new UFocus feature allows you to shoot first and focus later, as the HTC One (M8) has two independent lenses that allow it to detect and calculate the relative distance of subjects in the image. You can also alter the background with creative effects using Foregrounder, give your best shots a seasonal flavour using the Seasons animations, place your family and friends in a different photo entirely using Copy & Paste, and view your image from a different angle by simply tilting the screen using Dimension Plus. The HTC One (M8) also offers a 5-inch Full HD 1080p touchscreen with Touch AF, a 5 megapixel wide-angle front facing camera, 8fps burst shooting, fast autofocusing at a speed of 0.3 second, an LED dual flash, Geotagging, Full 1080p HD videos at 30fps, Slow Motion video mode, HDR mode for both stills and video, and the innovative Zoe shooting mode, which takes up to 20 shots and a 3 second video to create a "living photo" that you can share with friends and family. 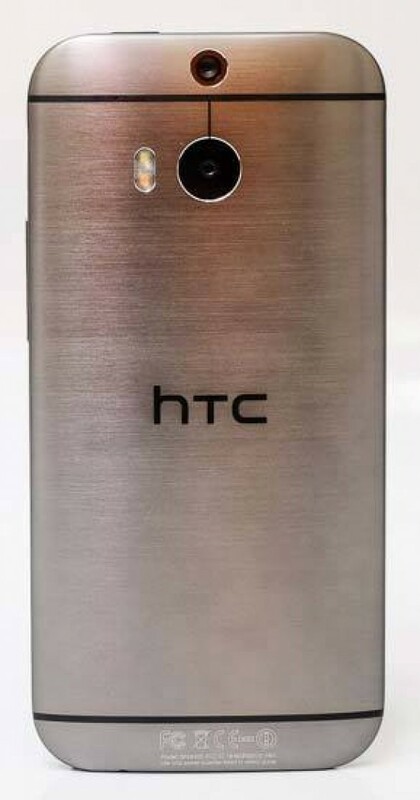 The HTC One (M8) is available now in Gunmetal Gray for around £530 / $649 unlocked. The HTC One (M8) is a large but quite light smartphone that just about fits into a trouser or jacket pocket, weighing 160g and measuring 146.36 x 70.6 x 9.35mm, slightly heavier and bigger than the original HTC One. It has a very solidly built unibody design that feels like it should more than withstand the odd knock or two, although we'd suggest investing in a suitable case to help protect it from scratches. The lens is a 28mm equivalent optic with a fast maximum aperture of f/2, alongside which is a twin LED Smart Flash that's a big improvement on last year's model. It works by making an instant light reading and firing the cool and warm LEDs in one of over a five hundred unique color temperature combinations that best match the scene, then automatically selecting the exact colour tone and light intensity for more natural skin tones. The HTC One (M8) offers 32Gb of built-in memory and also an external microSD memory slot. There's no physical shutter release button on the device, with the shutter fired instead via the touchscreen, which is a rather strange design decision on such a photographer-friendly smartphone. You can take a shot either by tapping on the subject to focus and then pressing the camera icon at the side of the screen to fire the shutter, or tapping on the subject to focus and fire the shutter at the same time. technology. In practice we found that we could still hand-hold the HTC One (M8) in fairly dark conditions and still get sharp results for both stills and video without resorting to using the rather ineffective built-in flash. There's no means of gripping the HTC One (M8) the front or rear, making it a little difficult to get to grips with, especially since its unibody design is very smooth. The lens isn't that close to the edge of the body, so you don't have to be too careful not to let your left forefinger stray into the frame. We had more problems shooting in portrait mode because the On/Off button is located directly under your left forefinger, inadvertently turning the device off on a few occasions. Press the small On/Off button on the top and the HTC One (M8) quickly readies itself for action in around a second, jumping straight into the camera mode if you were previously using it. Even better, when the phone is picked up in landscape orientation the camera automatically launches by simply pressing the volume button. We'd describe the general performance of the HTC One (M8) as very snappy, with little waiting around for the camera to take a picture - its certainly just as responsive as the majority of compact cameras that we've reviewed. By default the HTC One (M8) uses the Auto scene mode. The other available modes are Portrait, Landscape, Backlight, Text, Macro, Night, HDR, Anti Shake, Sweep Panorama and the new Manual mode. This latter mode allows you to set the white balance, exposure compensation, IOS speed, shutter speed and the manual focus point. via a series of onscreen sliders that are a little tricky to use. The HTC One (M8) has an HDR function to help even out tricky exposures, for example where a bright background would normally throw the foreground into deep shadow. You can see from the examples on the Image Quality page that this feature produces a photo with noticeably more dynamic range than one taken using one of the standard shooting modes, but at the same time without replicating the often "false" look of many HDR programs. It also usefully works when shooting video too. The HTC One (M8) also offers an extensive range of 15 creative effects. The Sweep Panorama mode lets you capture a panoramic image very easily without the use of a tripod. All you need to decide is whether you would like to start from left or right, top or bottom. Then press and hold down the shutter release while doing a "sweep" with the camera in hand. Exposure compensation is available before you start the sweep, but the exposure is fixed once you depress the shutter button. After you are done with the sweeping, the camera does all the processing required, and presents you with a finished panoramic image. Note that if you do the sweeping too slowly, or you let go of the shutter release button too early, the panorama will not be completed. The HTC One (M8) can shoot High Definition video clips at full 1080p or 720p HD with stereo sound in the MP4 format at 30fps. There's also a QVGA (320x240pixels) and an MMS friendly option (176x144 pixels), plus Slow Motion, Fast FullHD (60fps) and even Video HDR options. Note that you can't take a still image during video recording. In the unique Zoe mode, activated via the combined camera/video icon on the middle-left of the screen, the HTC One (M8) automatically captures up to 20 photos, a 1 second video before you pressed the shutter button and a 3 second video after you pressed it. You can then choose the best shot from the sequence, combine them into one file to create a Sequence Shot, remove unwanted objects, retouch the imagess, and share the highlights from your day or an event in a 30 second video clip on the HTC Zoe Share server. The 4 megapixel JPEG images are quickly committed to memory in a single second, the screen momentarily blanking out and then displaying the captured image before the user can go on to take a second shot. You can take a burst of images on the HTC One (M8) at 8fps as well as just a single-shot, a handy feature that many smartphones don't offer. The small thumbnail icon in the top-right corner is for playing back your images. You can browse through your photos by flicking them from side-to-side, zoom in and out by pinching, highlight, share, and delete them. The HTC One (M8) also offers quite a comprehensive Edit option, with the ability to add effetcs, frames, retouch and transform the image. The Effects menu is home to the Duo Camera features - UFocus, Foregrounder, Seasons, Copy & Paste, and Dimension Plus - you can see exaples of each one on the Image Quality page.